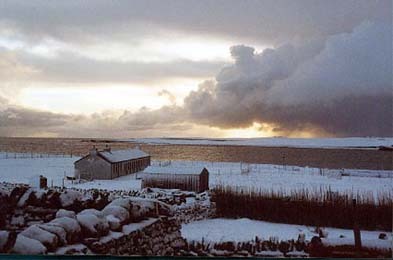 Papa Stronsay lies to the north east of the island of Stronsay. 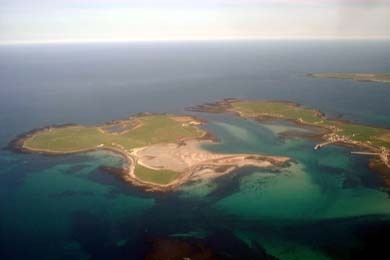 A very low lying island, Papa Stronsay reaches a maximum height of a mere 43 feet. From the early 18th to 20th centuries Papa Stronsay prospered from the fishing industry and once had five fish-curing stations. These stations worked in co-operation with fifteen more on the neighbouring island of Stronsay. The island went on the market again in 1999 and was purchased by a group of Transalpine Redemptorists to become their very own island Monastery. The population these days is around 26. ​None available to my knowledge with any great content about Papa Stronsay. This is not an island which seems to have merited much space in the history of our country. Several Orkney/Scottish Islands books mention Papa Stronsay in passing but nothing to merit buying any of them for information on this sparsely populated isle. As ever please contact Lonely-Isles if you know of any books you think would be of interest and we'll add them to the site. Papa Stronsay - Official web presence for Papa Stronsay. Essentially about the islands only inhabitants...the monks of Golgotha Monastery. Well designed site with a superb history and some excellent pictures. Stronsay - If planning a trip to Papa Stronsay you'll more than likely need to head for it's neighbour Stronsay first. This well put together site contains plenty of local information on Stronsay including how to get there.